Solar Roads: Energy Plus for the Future? Imagine driving down a road made of giant solar panels. 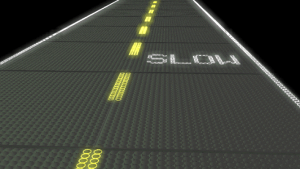 White strips of LED lights in the road brightly mark the lanes - especially helpful in the early morning darkness. Additional lights in the road suddenly blink on to warn, "Caution. Deer crossing." Sure enough, two hundred yards later, four deer hop across the road and bound into the snow on the other side. Thick white flakes still pour down, but they melt as they hit the road surface because the road is self-heated. Welcome to a solar road. Scott Brusaw of Sagle, Idaho hopes to make solar roadways a reality. Last summer, he received a $100,000 small business contract from the US Department of Transportation to develop prototypes of his invention. Working with Pennsylvania State University's Materials Research Institute, Brusaw has been spending the past five months getting his product ready for testing. He's scheduled to deliver the panels to the DOT by February 12, 2010. The positives? Thousands of miles of roads would not only get us from here to there, but would provide for all our energy needs. Solar energy from the roads would power the LED strips, as well as all houses and businesses in the vicinity. Not only could this technology eliminate the need for other power plants, but gas guzzling cars could also get phased out. Brusaw imagines a series of recharge stations for electric cars along the new solar highways. The self-warming roads would save states millions of dollars per year in snow-plows, sand and cinders, not to mention the added wear and tear on asphalt. Goodbye to black ice forever. Brusaw also claims that all electric and phone wires could be run under the road so that we could get rid of unsightly telephone poles and their tendency to get knocked down in storms. It sounds fantastic. Solar roads could provide us with a massive supply of renewable energy and solve the endless problem of how to pay for road and infrastructure maintenance. Brusaw and the folks at Penn State still have a series of hurdles in their way, though. First off, they need glass strong enough to withstand the constant beating of tractor trailers zooming along at 80-miles-per-hour month after month. The glass has to be textured in order to give vehicles traction and to allow water to run off. It also needs to be able to handle it when tires roll over dirt and rocks and branches and dead opossums. The areas of highest population will also have to deal with cars covering the roads, blocking sunlight. While Wyoming and Nevada may produce a surplus of power, that may not necessarily help New Jersey. The cost will be another issue. Yes, states will theoretically be able to generate revenue from the roads once they are installed, but the $6,900 price tag for a 12 x 12 panel is a hefty initial cost for something that's never been tried before. There are other questions to answer too. How hard would the panels be to replace? How will the energy be harnessed and distributed, and who will be in charge of it all? We hope Brusaw and his wife get to enjoy that free Red Lobster dinner, and we look forward to seeing what happens to his Solar Road Panels after February 12th.